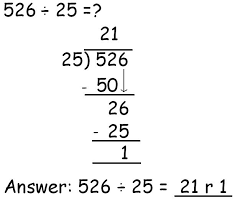 First when doing a division problem you round your numbers to the nearest ten,that is how you would get your estimated answer. Now you are ready to set up your house.Put your whole (the first number)in the house. Then you put your divisor (the second number) on the outside of your house. The first thing you do is see if you have a decimal then put it on the top of the house directly above it. Now you see how many times your divisor can go into the first number of your whole.If it can you find the closest number you would multiply to get to the number in the house.DO NOT GO OVER THE NUMBER. If it didn't go to the next number.For example,2 would become 23 if the next number was 3. Now you do the multiplication to find your number to put under the whole,and put the number you multiplied above the number in the whole,put it on top of the house. Now you subtract the number you got from multiplying from the whole,but make sure you put it under the number only that you multiplied to get to not the entire number. Now that you have subtracted you make sure it is less than your divisor,if it is and you have a number in the whole left you bring down that number to your answer to the subtraction. If you don't have something to bring down add a zero.If you add a zero and your number isn't a decimal add a decimal and a zero. You can now see how many times your divisor goes into the new number. Then you get the answer to the multiplication and subtract it from your other number in the house,if the answer to the subtraction is zero you are done. If it was not zero it becomes your remainder.If you had a decimal you would put a zero that adds onto your whole. Then repeat the steps until the subtraction equals a zero.